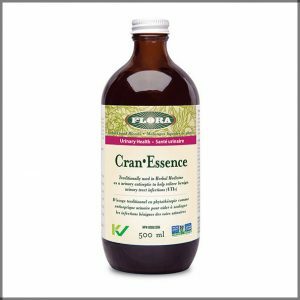 Flora CRAN-ESSENCE – A blend of 9 herbs in a base of cranberry juice concentrate that promotes and maintains normal urinary tract health. These added herbs are traditionally used for their diuretic and antiseptic properties, which help flush the bladder and urethra. Flora Cran-Essence is a tasty liquid formula that helps to support urinary tract health and relieve benign urinary tract infections (UTIs).